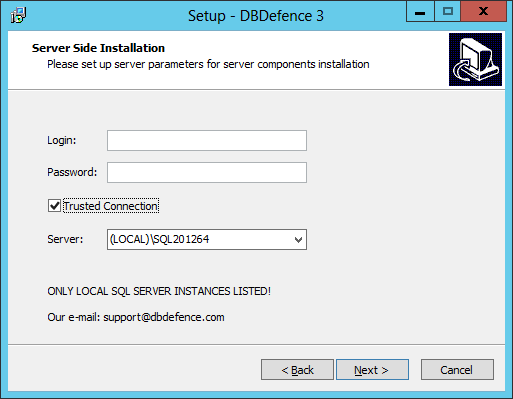 Important: You can only install DbDefence to local SQL instances. DbDefence can't be installed remotely! 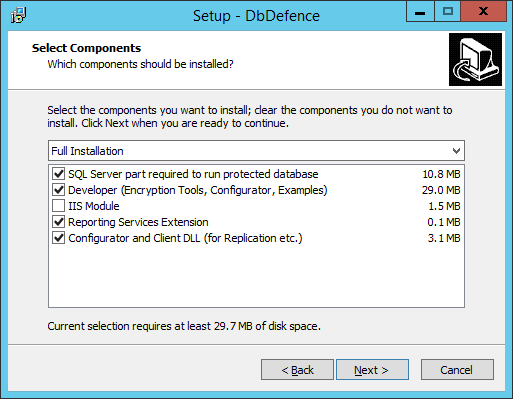 DbDefence can be installed using the interactive installer or it can be installed manually. You can read more about how to perform a manual command line installation in the Distribution section. DbDefence will initially be installed as a free version, but after activation with a valid activation key, the installation will switch to the full version without limitations. The Free Version can be used in commercial projects. However, the Free Version has a limited database size of up to 200Mb. You can read more about obtaining the full version. De-selecting Server Part Installation will skip the installation on the SQL Server. De-selecting Client Side Installation will prevent the installation of the encryption tools and the documentation. In this case, only the configuration and decryption tools will be installed. "IIS Module" is very specific component. In most cases it is not required, but may slow down IIS performance. If you upgrade from a previous version, you do not need to uninstall the previous version. However, you will still need to restart the SQL Server instance anyway to reflect the changes.